Coastside Veterinary Clinic, Inc. is Half Moon bay's only AAHA certified practice. 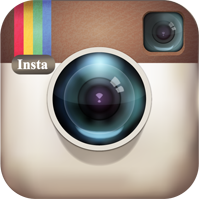 Learn all about our great veterinary staff here! 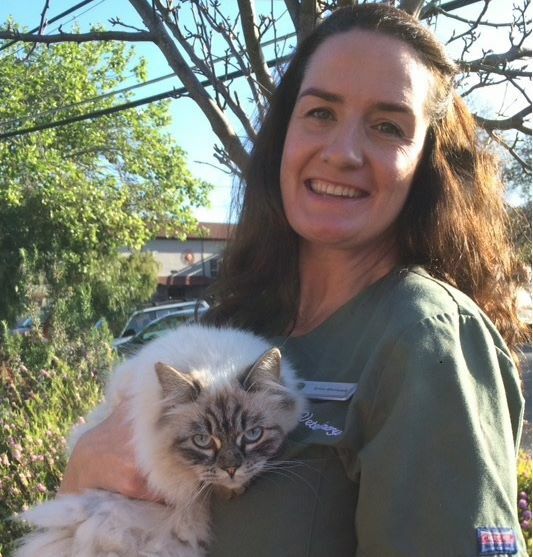 Penelope Gunning, RVT, attended Foothill Community College where she received her Associate of Science Degree in Veterinary Technology in 2002. Born and raised on the Coastside, Penelope still resides here with her husband and three kids. She participates in barrel racing and enjoys attending competitions as often as possible. Penelope grew up with large and small animals and has worked for small animal veterinary hospitals since 1999. Matthias Rosseel, animal care intern, currently attends Cal Poly SLO where he is working towards his degree in Animal Science with a concentration in pre-veterinary medicine. Born and raised in the Bay Area, Matthias’ family has been a client of CVC for 11 years, bringing by his 5 dogs and many fosters. When not helping at the clinic or in school, Matthias spends his time playing with his dogs, enjoying video games, and reading non-fiction. UPDATE!! Matt was recently accepted to veterinary school in England, Oregon and California, UC Davis. We are so happy for him. Jerrica Tam, Veterinary Assistant, was born and raised in San Francisco. She has been working and volunteering at various small animal hospitals in the San Francisco Bay Area since 2009. She has two dogs and a cat, and in her spare time enjoys traveling, learning foreign languages, and eating her way through the Bay Area. Erica Abernathy, our customer care specialist, was born and raised in Palo Alto and has fond memories of raising her Golden Retriever puppy, Dublin, to be a Guide Dog for the Blind. She graduated from UC Santa Barbara with a degree in Environmental Studies and continues to enjoy outdoor activities such as kayaking, camping, and backpacking with her husband, Erik. She worked as a horse wrangler in Mammoth Lakes for several years before moving to Half Moon Bay to be closer to her 5 nieces and nephews including Auggie, the Labradoodle. 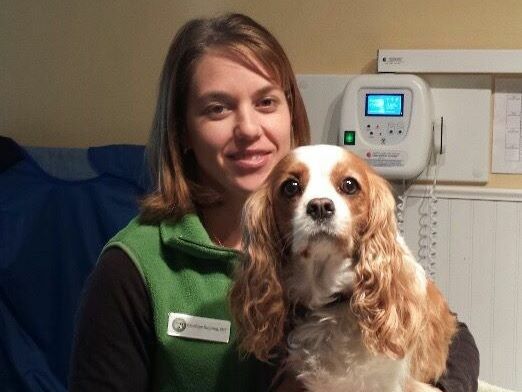 Kelly Clemente is our the Receptionist at Coastside Veterinary Clinic. She is attending Canada Community College and working on a degree in Psychology. Born and raised in San Mateo California where she continues to enjoy spending time with her family including Buddy her Pomeranian puppy. Kelly is a very independent person with a positive attitude who wants to give the best customer service to clients and their furry friends. 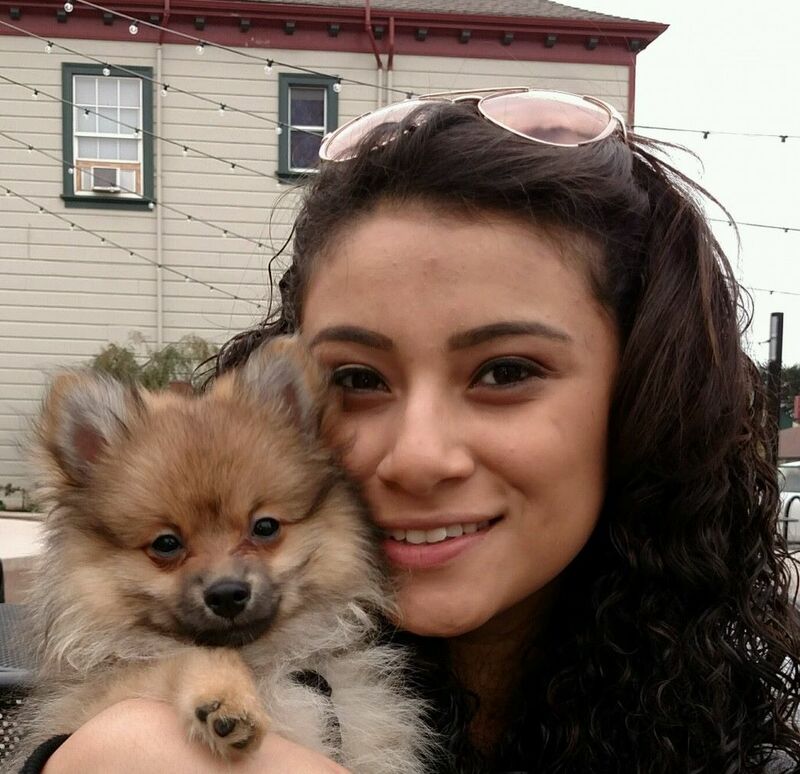 Gabi Sarabia was raised in Half Moon Bay and grew up on a ranch where she developed her love for animals. Growing up she had a variety of pets; chickens, guinea pigs, small birds, cats and dogs. 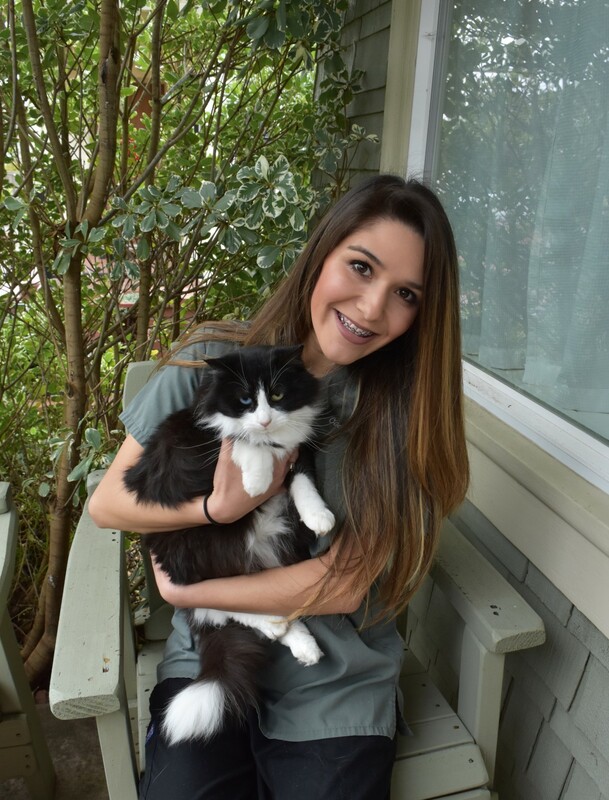 She attended Animal behavior college where she completed a veterinary assistant program and received her certification as a Veterinary Assistant. When Gabi is not at work she enjoys spending time with her German Shepard puppy, Kira.